Inventor 2015 is one of the best releases yet, unlike any other CAD tool on the market today because it not only delivers enhancements to existing tools and UI but adds new technology that makes this product so unique. There’s 2 big additions and many enhancements, so in this article I’m going to concentrate on Parametric Direct Editing, Freeform and Large Assembly Express Mode. The ongoing debate in CAD modellers has been what’s better; Parametric or Direct Editing? What about having both? Changing features in parts with complex histories in Parametric modellers can be painful and a slow process because changes can affect other features causing errors, analysing those errors and rework. It can be hard to edit complex parts with Parametric Modellers, especially when it is someone else’s creation or been a while since the file was used, which is why many CAD users like Direct Editing, you’re not constrained by a history of features. Direct Editing methodology also has it’s disadvantages too. What if you could edit parts without affecting the history? What if you wanted to explore changes without committing to them or make a quick change and not have to go through re-editing features or reading error lists and fixing them? With the new Direct Edit tool you can parametrically move, size and rotate imported solids or native Inventor files. The Direct Edit tool allows you to select faces or solid bodies and make direct edits to them. Options include changing the triad, orientating the selection and snapping parallel to other geometry. You can push and pull geometry to the desired size or enter in a value. While editing using the size tool (say the thickness of a body) is limited to an offset, changing the size of holes can be done by offset, diameter and radius. 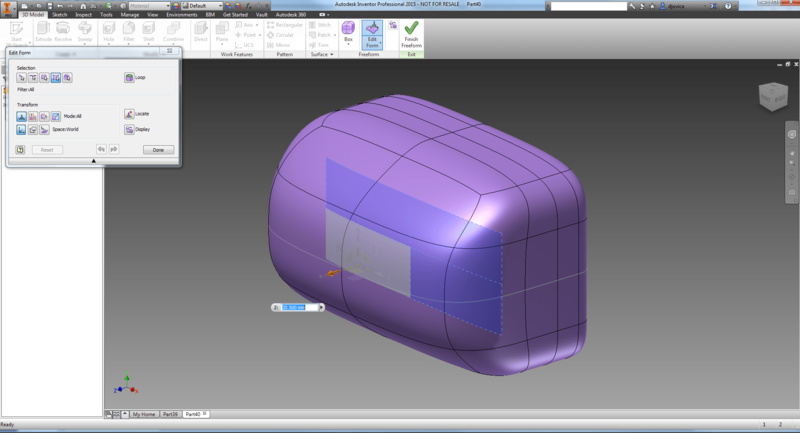 While making a direct edit, Inventor will preview the change so you can see what the desired affect is. If a direct edit is made, an icon will show next to the edit in the modelling environment and also in the history tree. Double clicking on either will allow you to re-edit. Another nice feature when entering values is that you can use run equations, select pre-defined parameters such as diameter or re-use commonly used values too. Deleting the Direct Edit in the History Tree will restore the geometry back to the original state. If you use CAD for surfacing, need to design complex geometry or create designs where aesthetics make a difference, then T-Splines will make you question your current CAD tool and how much time you’ve wasted over the years. Purchased by Autodesk in 2012, incorporated in Fusion 360 and popular amongst Rhino users, T-Splines is a solid-body surfacing tool which makes surfacing dramatically easier while maintaining G2 Continuity. It makes NURBS modeling easier by picking single or multiple faces, control points/vertices or edges and by push/pull or specifying a numeric vaule, modifying the surface. If you need nothing but the best Class-A Surfaces, use Alias or ICEM Surf, however, like most users, who need a 3D Mechanical CAD tool with excellent, easy to use Surfacing, Inventor 2015 leads the pack. Express Mode came in 2014 with Large Assemblies opening 6x faster, but once it was opened, you couldn’t do much with it other than view, Save As, Pack & Go or Export. AutoCAD Electrical Catalogue Add-In – The Catalogue Browser is a modeless palette which means it can remain on the screen while other commands are used. As you download parts from vendors or create your own parts, you can associate those parts to a catalogue value for use within the Catalogue Browser. Sketching: Relax Mode – When Relax Mode in on, this new enhancement will override constraints and make the appropriate constraint to fit. Wrap to Surface/Face – This creates a custom helix curve as a lightweight more precise curve. Frame Generator: Member Reuse – Been a long time coming, you can cut down on members in your Assembly by selecting a source member. Joint Command supports creating a joint Between Two Faces and offsetting the origin. These commands were already available in the constraint tool, but have now added them to Joints. With the new Navigator command, you can navigate to and define the visibility status of scan regions, or scan locations in a point cloud. Use the new Cloud Plane command to create a construction plane inferred from a set of points in a point cloud. You can now measure the distance from a Point Cloud to a Point Cloud plane and other geometry. It’s a pretty impressive 3D MCAD System for the midrange market. I’m sure there are better Direct Editors out there and the top-end of town probably has better larger assemblies performance, but I don’t think there’s anything out there that can do 3D MCAD, Hybrid Parametric Direct Editing, N.U.R.B.S, T-Splines and native DWG drawing, not to mention all the other great tools. Add to that, users buy Inventor in Product Design Suite which comes with Inventor, AutoCAD Mechanical, Raster Design, ReCap, 3ds Max Design, Navisworks and AutoCAD Electrical depending on which Suite you get. When you consider the suite of technology you get from Autodesk is the same price as any other midrange 3D CAD System, it’s hard not to be impressed with Autodesk are doing.